The easiest way to search for duplicate local listings in Google Maps. If you need to look in Facebook, Foursquare, Factual or Yelp, please use the old tool here. The easiest way to search for duplicate listings in Google, Facebook, Foursquare, Factual and Yelp, to find google plus page for local Listing. Start typing the city or address of the Listing and select it from the drop down menu. This will automatically add coordinates. 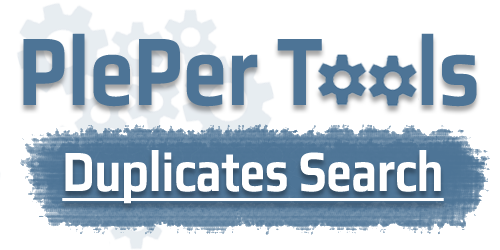 Then you will see many listings, select the original listing and click on "Search duplicates for this Listing" button. If you will use only search functionality, you can use operator "||" (OR) for multy search, but this works only for google. Example : Instead of making two searches, one for KEYWORD and one for PHONE_NUMBER you can combinate them like that : KEYWORD || PHONE_NUMBER with maximum three terms. Registered users can search by TYPE in Google. Let`s say you want to see top 40 dentist around entered address.